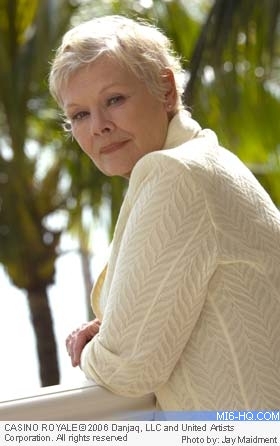 Dame Judi Dench had given some hints that M might be travelling abroad again in the 22nd James Bond film due out 7th November 2008. Speaking on the red carpet of the UK National Movie Awards, Dench was asked about the upcoming Bond film, which will be Daniel Craig's second as 007. "All I've been told is to stand by for - I think - December, and I might get away again"
Dench has played MI6 chief M since Pierce Brosnan debuted as Bond in 1995's "GoldenEye". Click here for complete coverage of Bond 22 on MI6. Thanks to `Pierce - Daniel` for the alert.